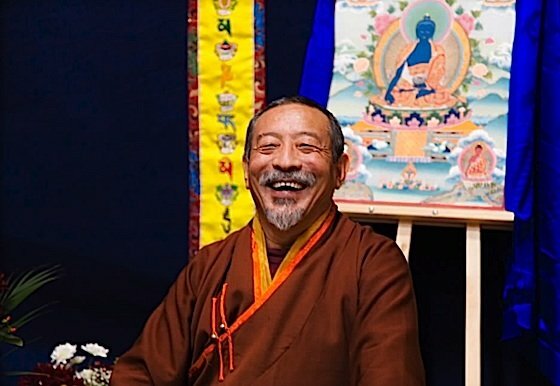 Rinpoche speaks of important practices such as Medicine Buddha and Black Manjushri — both practices do not require initiation. [Rinpoche advises that recitation of the Medicine Buddha Sutra is beneficial. The full English version is at the end of this feature.] Rinpoche promised to elaborate on the specialized deity practices, such as Black Manjushri in a coming video. 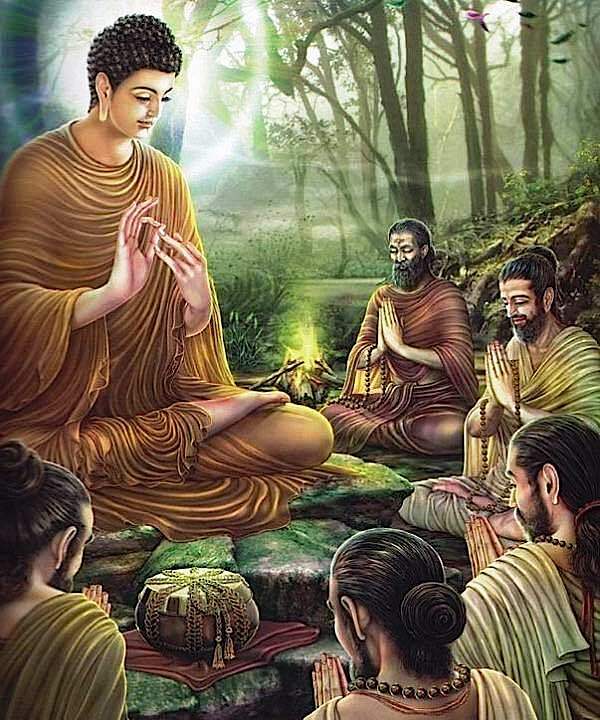 — and do visualization of Medicine Buddha. The Lapis Lazuli Medicine Guru is revered in many countries by different names: Sanye Menla (Tibetan སངས་རྒྱས་སྨན་བླ།, or just Menla), Medicine King, Medicine Guru, Yaoshifo (藥師佛 Chinese name), Nyorai or Yakushi (in Japan 薬師, 薬師如来), Yaksabul or Yaksayeorae (약사불, 약사여래 in Korea)or Lapis Luzuli Buddha. Let me put it this way. If you don’t have initiation of Medicine Buddha, you can still do mantra of Medicine Buddha, no problem. 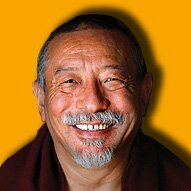 Ideally, later, you should receive transmission, “lung” from Lama, your teacher, that would be good. If not, you can still do the mantra no problem. 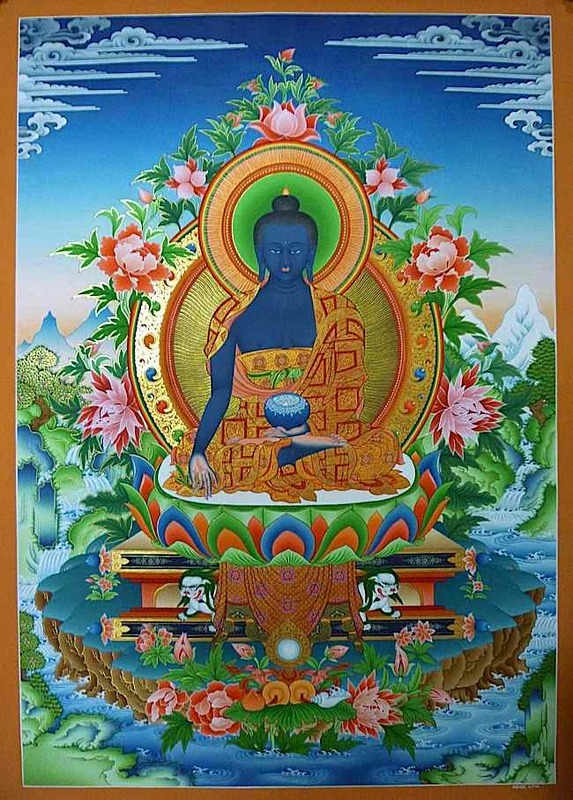 You can visualize Medicine Buddha in front of you, or above you. Imagine beautiful blue light shining from His heart. The light dissolves into you, into your body, purifying your body and healing the illness. 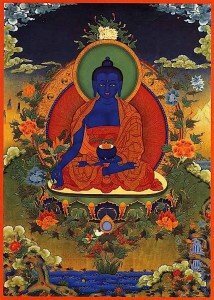 You can also imagine nectar flowing, coming from the bowl that Medicine Buddha is holding in his left hand. White nectar coming down and dissolving into you, through your crown into your body. That will be very beneficial. Then, of course, if you have the initiation, if you receive the initiation, that will be very good, even more powerful. Visualizing the Medicine Buddha Mantra and rays of healing Lapis Lazuli light emanating from the Buddha, and absorbed into the patient (or self) assists in healing. There are other healing practices you can do. Black Manjushri practice is very powerful. I have given Black Manjushri initiation for lots of people the last couple of years. I have students or friends who had cancer, breast cancer, prostrate cancer, stomach cancer, and other types of cancer. They have been doing their practice. They also went through chemo therapy. It has been very beneficial. A number of my friends and students who had cancer, their cancer is no longer detectable. They are clear. And they appreciate it. So, you can do Black Manjushri practice again, same way you do Medicine Buddha. You don’t have initiation? You can still do the mantra, and visualize Black Manjushri above your crown. If you have the initiation that will be better. If you don’t have initiation, I can suggest that you go and receive it the first chance you get. 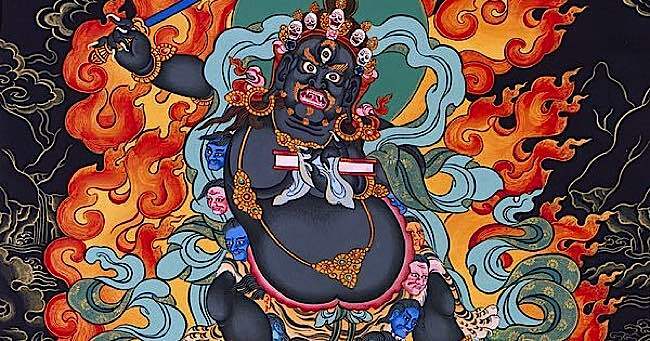 Black Manjushri practice is also very helpful for sickness caused by chemicals, pollution, toxins, poisoned water and food — like what’s happening today in the world. People are exposed to radiation, chemicals, or whatever. Also, people who are suffering from fear and paranoia. Or, if someone is attacking them mentally, like a curse, or your own mind. Fear. So, Black Manjushri practice is very powerful. 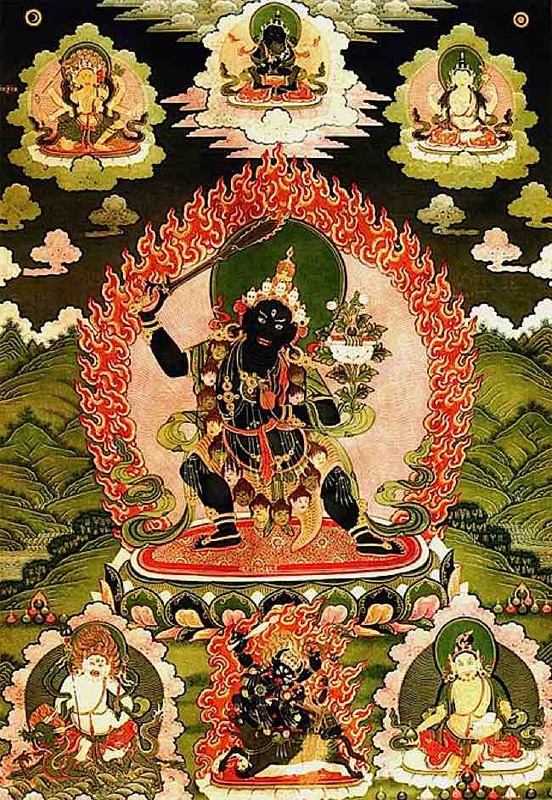 Black Manjushri is known for healing practices involving aggressive health conditions such as cancer. 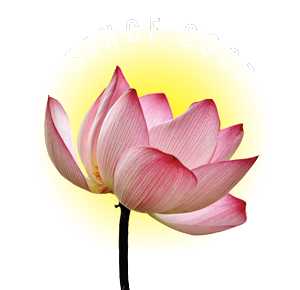 Also, we can do these healing practices, Medicine Buddha and Black Manjushri, for others, who don’t have initiation, or can’t do the practice or visualization because they are too weak or they are not sure, they have no confidence to do the practice. But, they are willing to accept our help, then of course we should help. 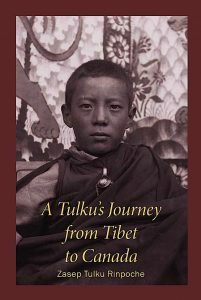 Zasep Rinpoche advises that students who are not initiated can chant the mantra while visualizing the peaceful image of Black Manjushri (rather than the wrathful version): “I advise using the mantra while visualizing a peaceful Black Manjushri with blue light coming to her for healing.” (Her, referred to the student asking the question.) He indicated you do not have to have initiation to chant the mantra, as long as you visualize Black Manjushri in front of you in peaceful form (i.e. no self-generation). For a video helpful for “chanting along” see the bottom of this feature. Many students and teachers turn to the peaceful version of Black Manjushri as healing meditational deitiy for aggressive diseases such as Cancer and Aids. 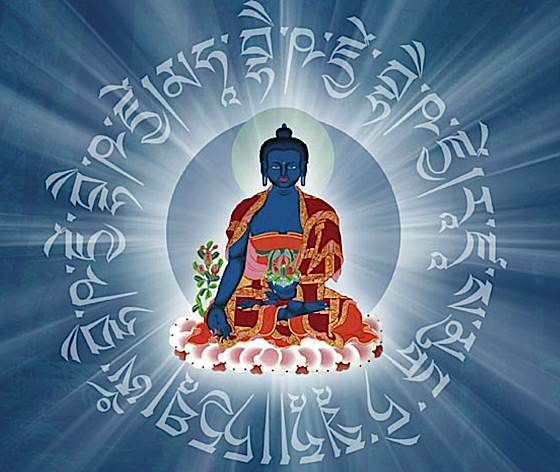 Full Text Medicine Buddha Sutra after Bio of Venerable Rinpoche. 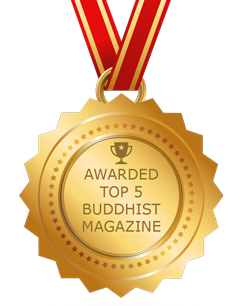 The Lapis Lazuli serenity of Medicine Buddha is healing.